The region’s natural scenic beauty, Native pueblo cultures, and old Spanish villages provided abundant and exotic subject matter for painting and sculpture. Yet many of the artists who first chose Santa Fe as their permanent residence did so because its dry, clean air was a life-saving tonic for respiratory disease. 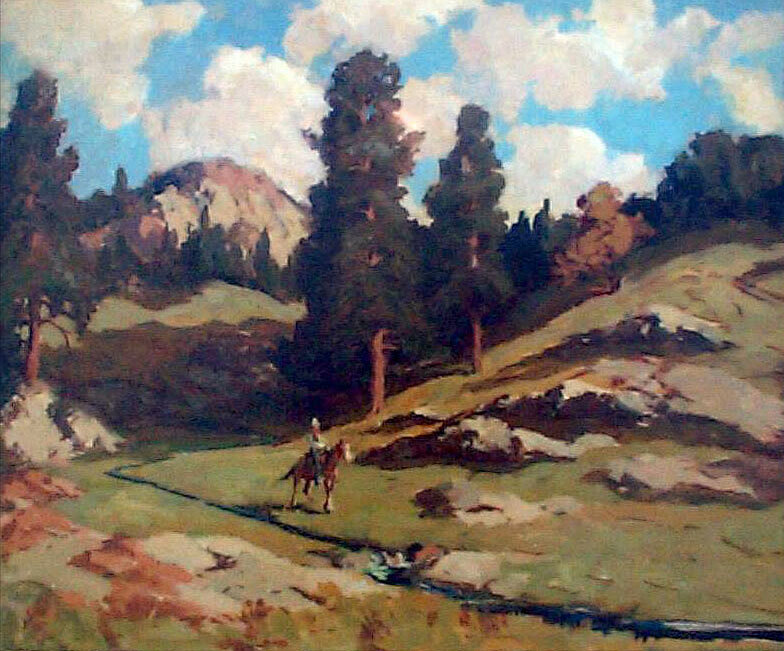 Carlos Vierra, generally credited as the first professional artist to settle in Santa Fe, arrived in 1904 to be treated at Sunmount Sanitarium, which was located up on Monte Sol, the large hill above Canyon Road. The first artist to reside permanently in the neighborhood was Gerald Cassidy who bought the house at 1000 Canyon Road in 1915. Cassidy had become familiar with the native peoples of northern New Mexico in 1890 when he entered a sanitarium in Albuquerque with severe pneumonia and six months to live. 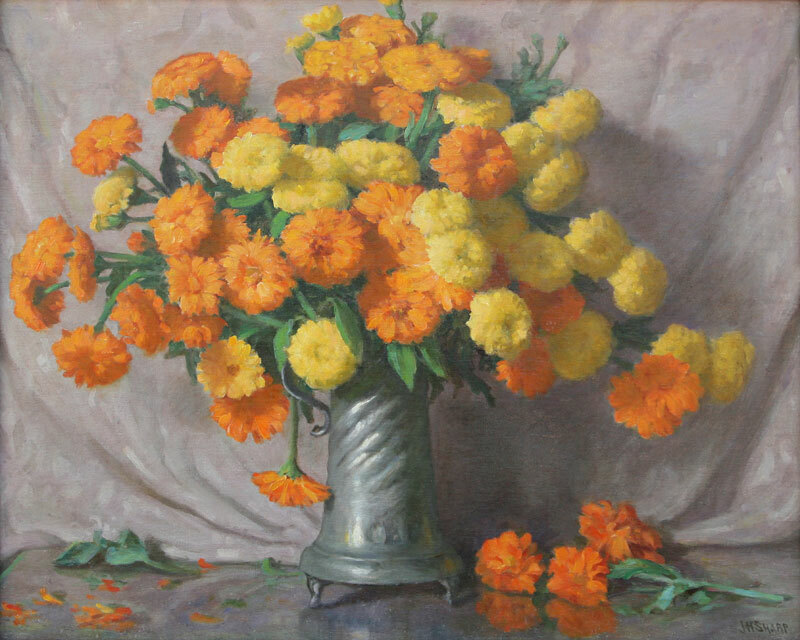 In 1912, fully recovered and newly married, Cassidy decided to relocate to Santa Fe with the intention of giving up his career as a commercial artist and devoting himself to painting full-time. 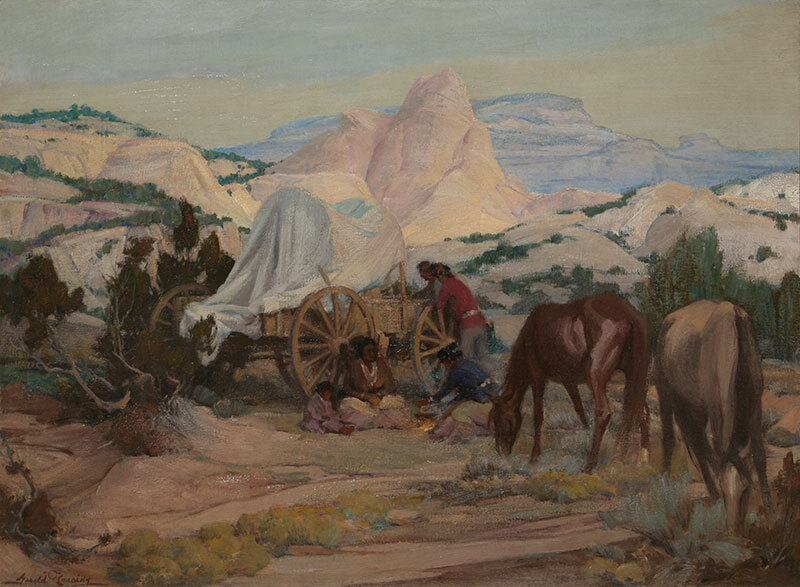 A painter of southwestern landscapes, Native American genre scenes, and Native portraits, Cassidy spent the majority of his fine art career at the Canyon Road house and studio where he died in 1934. Sheldon Parsons, a successful portrait painter in New York, arrived in Santa Fe in 1913 suffering a relapse of tuberculosis. Recently widowed, Parsons and his young daughter first took a small apartment near the plaza, but later moved into the Cassidys’ house on Canyon Road while the Cassidys were traveling abroad. In 1924, Parsons bought a tract of land at the foot of Upper Canyon Road where he built an adobe home and studio in the Spanish-Pueblo style. Known for his aspen-studded landscapes and scenes of old adobe homes, Parsons lived and painted in his Canyon Road home until his death in 1943. In 1916, Santa Fe’s fledgling art community received a major boost with the arrival of William Penhallow Henderson, a successful painter and teacher, and Alice Corbin Henderson, a poet and associate editor of the influential Poetry magazine. The Hendersons came to Santa Fe so that Alice could be treated at Sunmount for advanced tuberculosis. While Alice was still living at the sanitarium, William bought a small adobe house at the bottom of the Sunmount road, Camino del Monte Sol, just south of Canyon Road. With their new home completed, W. P. Henderson converted the original house into his painting studio and the office for his construction business. Begun in 1926, The Pueblo Spanish Building Company created Spanish-Pueblo revival or “Santa Fe Style” architecture and furniture. A modern combination of Pueblo Indian and Spanish colonial adobe building styles, this look was being promoted by Santa Fe’s town fathers as a tourist draw as early as 1910. The members of Santa Fe’s art colony became early and enthusiastic promoters of the movement, usually building their own homes in the style. Indeed, the region’s indigenous adobe architecture was a major part of the aesthetic that had drawn them to live and paint in Santa Fe. Henderson was one of the most skilled of the artist / builders and was responsible for such surviving gems as the restoration of the historic Sena Plaza on Palace Avenue, Fremont Ellis’ last home on Canyon Road, and the Wheelwright Museum. By 1919, Santa Fe’s growing reputation among east coast artists induced two friends from New York, John Sloan and Randall Davey, to take their wives on a cross-country excursion in a 1912 Simplex touring car. Well established artists in their own right (both had shown in New York’s legendary Armory Show in 1913, and Sloan was a member of a group known as “The Eight” which is credited as the origin of the “Ashcan School”) they carried a letter of introduction from their friend and mentor Robert Henri. Henri was an enthusiastic, if occasional, visitor to Santa Fe starting in 1917, but he did not embrace New Mexico with the life-long zeal shown by his friends. Sloan spent more than 30 summers in Santa Fe, living and painting in a studio on Garcia Street in the Canyon Road neighborhood. He returned each winter to New York where he painted, taught, and built a reputation as one of the nation’s leading artists. Davey decided to make Santa Fe his permanent home, returning in 1920 to purchase a large tract of land at the end of Upper Canyon Road. Included on the property was the old sawmill built by the US Army in 1847. With his wife and son, Davey restored and enlarged the building to use as their home. Davey also converted an old stone storage shed into the studio where he painted portraits, landscapes, and horse racing scenes until his death in 1964. In a few short years, the presence of nationally known artists such as Henri, Sloan, and Davey had permanently established Santa Fe’s reputation as an important art colony. The next year, Ellis joined with four other newly arrived artists, Josef Bakos, Walter Mruk,Willard Nash, and Will Shuster, to form Los Cinco Pintores or The Five Painters. All five artists were under 30 years of age when they arrived, and their work was strongly influenced by the Independent Movement led by Henri and Sloan, which sought to escape the conventions and limitations of academic art. As young “independent” artists in the early 1920s, Los Cinco Pintores were enthralled with the artistic energy of Santa Fe, but still had a difficult time making a living. Consequently, the five friends resolved to build their own homes with their own hands despite that fact that none (except Bakos, who knew carpentry) had any building experience, especially with adobe. Securing land near W. P. Henderson’s studio, they started building small houses all in a row leading up the west side of Camino del Monte Sol. Will Shuster later recalled that he and Fremont Ellis were out building one day when Shuster noticed that Ellis’ wall was leaning precariously. Will Shuster, who probably suggested the move to The Camino, likely did so because his friend Frank Applegate had built a house there in 1922 and eagerly welcomed the Pintores as new neighbors. A sculpture and ceramics teacher in Trenton, New Jersey, Applegate first visited Santa Fe in 1921 on a tour to study native clays. After a week spent camping in the Cassidys’ orchard, he and his family decided to make Santa Fe their permanent home. Unlike Los Cinco Pintores, Applegate had studied architecture and was well equipped to design his own home and to offer advice to his young friends. In fact, Applegate quickly became one of the leaders of the Spanish/Pueblo revival movement in architecture. Along with the writer Mary Austin, he formed an organization, which provided funds for the preservation of historic adobe churches at Chimayo, Trampas, Acoma, Laguna, and Zia. In 1925 he renovated an old four-room Spanish farmhouse just off the Camino, enlarged it and incorporated details such as balconies and cupboards from other historic Spanish homes in the area. About the time Frank Applegate was remodeling his house, the cubist painter,Andrew Dasburg, moved into a new house on The Camino and became Applegate’s neighbor. Already established in New York art and literary circles (he, too, exhibited in the 1913 Armory Show), Dasburg first traveled to New Mexico in 1917 at the invitation of Mabel Dodge Luhan, legendary patroness of the arts and hostess of radical salons in New York and Taos. Dasburg’s wife, Ida, had organized the Provincetown theater group in Massachusetts and had been married to the radical writer Max Eastman, founder of the leftist periodical, The Masses. Between the Dasburgs and their neighbors, Alice and William Henderson, Mary Austin, and Lynn Riggs (author of Green Grow the Lilacswhich became Oklahoma! ), The Camino saw more than its share of literary, musical, and artistic gatherings. The group occasionally acted, sang, and danced in their own productions, often with Lynn Riggs on guitar and Fremont Ellis on drums. Neighborhood gatherings also included interested houseguests from “back east,” such as Willa Cather, Aaron Copland, Thornton Wilder, Edna Ferber, Ernest Block, and Martha Graham. Olive Rush, an illustrator who studied with the master, Howard Pyle, had been spending time in Paris when her father asked her to accompany him on a western trip in 1914. In 1920, she returned to live permanently in Santa Fe. Rush settled on Canyon Road, buying the Rodriguez house, already a century old, and decorated it with Native and Spanish artifacts as well as her own artwork. Rush developed an interest in fresco painting and completed murals in the Santa Fe Post Office (now the Museum of New Mexico History Library) and the Santa Fe Indian School in addition to her home. A life-long Quaker, Rush bequeathed the house to the Society of Friends who still hold meetings among Rush’s art. Artist Datus Myers and architect Alice Clark Myers, first arrived in Santa Fe in 1923 on a painting trip. Like so many other artists, the Myers found Santa Fe irresistible, and in 1925, they moved into the Canyon Road neighborhood where they remodeled an old adobe on the Camino. Datus Myers had studied painting and sculpture at the Chicago Art Institute where he met Alice Clark, one of the first female graduates in architecture. 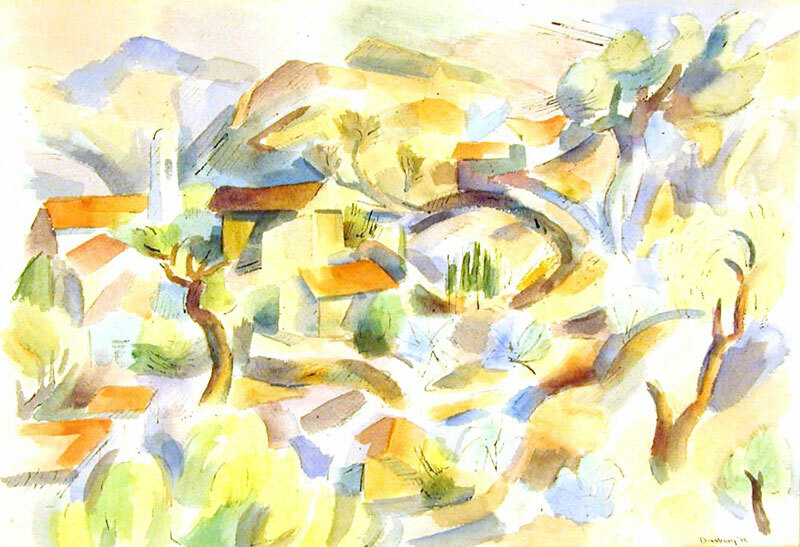 In the 1930s, Datus served as coordinator for the Federal Public Works of Art Project for New Mexico, and later taught at the Arsuna School of Fine Arts, which occupied Mary Austin’s home on The Camino after her death in 1934. Another victim of Santa Fe’s spell, Odon Hullenkremer, moved to Santa Fe from Toledo, Ohio in 1933. A native of Budapest, Hullenkremer undoubtedly was the best-trained academic artist in Santa Fe, having studied in Paris, Munich, Berlin, and Cairo in addition to his hometown. Settling into a home and studio at 820 Canyon Road, he built a highly successful portrait career. Known as an eccentric and a raconteur, Hullenkremer entertained a loyal following over cocktails almost daily at La Posada Hotel. However, the group rarely included other well-known artists, as he was a vocal critic of the Modernist Movement, which dominated Santa Fe (and the Euro-American art world) at the time. At the end of the Second World War, the Canyon Road neighborhood retained much of its rural character. Many descendents of the original Spanish farmers still lived in the aging adobe homes and some still farmed the small plots by the acequia and the river. But now, this centuries old neighborhood and its local culture existed side by side with a new, even avant garde, culture of fine artists, writers and musicians, many of whom were trained in Europe and most of whom were notable figures in the New York art world. For more information on early Santa Fe painters, please visit the Medicine Man Gallery website.